What was surprising (and new) here in Burberry's spring/summer 2014 menswear collection, was the route it took in its tailoring skills - relaxed and comfortably easy to combine. Burberry is better known for their sartorial trench coats, but Bailey's spring selection of cashmere colored numbers felt looser in fit. The opening look in a soft camel coat was one to add in your next's wish list - relaxed, special, and rich in color and texture. Knitted sweaters were unique themselves - cut lower in shape and design - with a pleasing palette of colors. 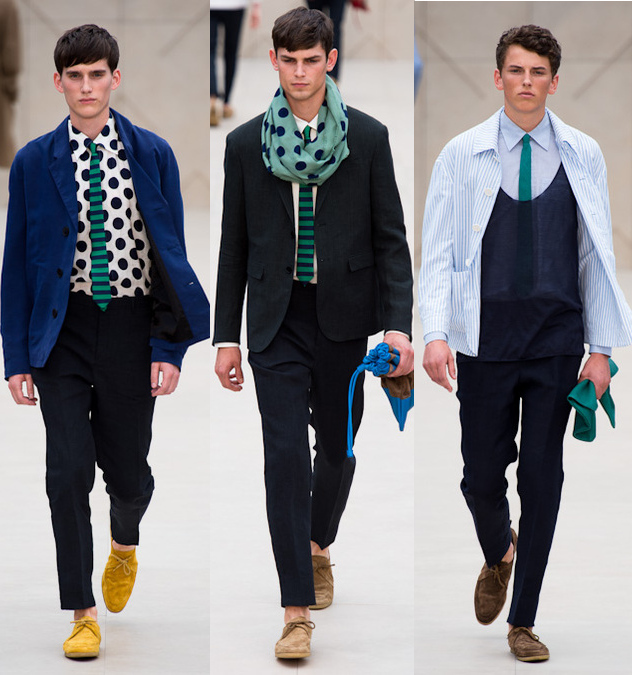 Polka dots also became a not so surprising subtler print in Burberry's runway. 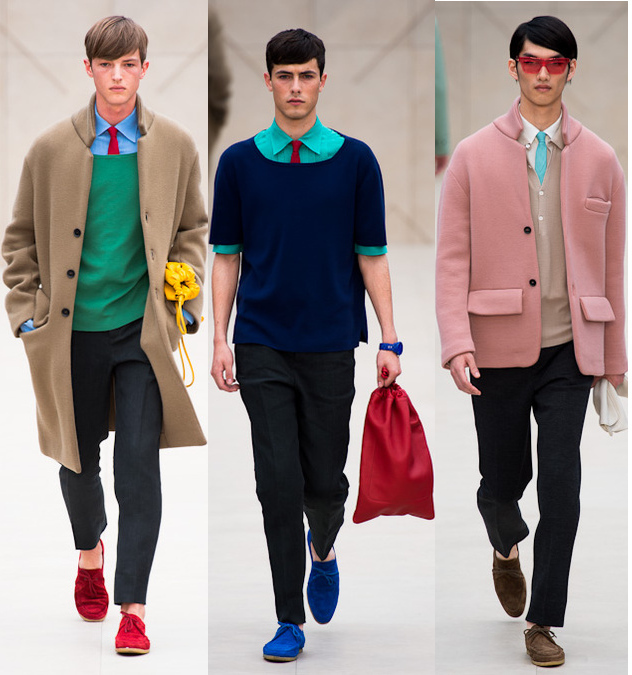 Bailey has done an extraordinarily job in keeping the Burberry man on top of the trend. We can still recall his first spring 2013 introduction in aluminum metallic colors that became a mega streetstyle hit, and his fall 2013 cheetah and heart prints. But because of his two successful seasons in various risky prints and colors, we were expecting another potential surprise. 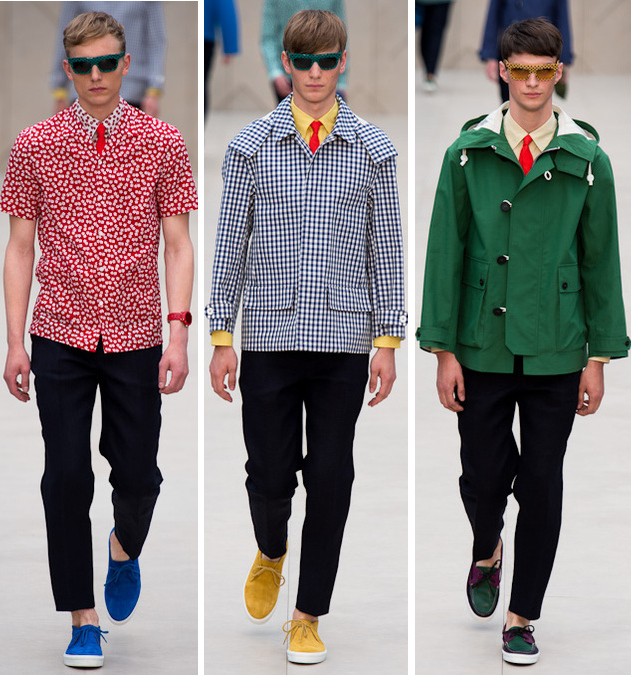 All the contrary, prints were perhaps too relaxed for the Burberry man, but acceptable enough to look dapper in your dotted shirt or scarf paired with a comfortable suit in a striped tie, and vibrant colored suede boat shoes. The most confident of all were Bailey's spring polka dot sunglasses. It was the strategy of Bailey's layering techniques though that will most likely be one to began adopting now. He took some semi-formal looks and layered them in linen tank tops finished with what appeared to be shirt jackets, as well as clean hoodies and knits that lifted the atmosphere. Simply easy to grasp. And not having added a single floral print look could have made the Burberry customer upsetting. Thankfully, Bailey got the memo and added two looks - one in red and green - to his presentation. 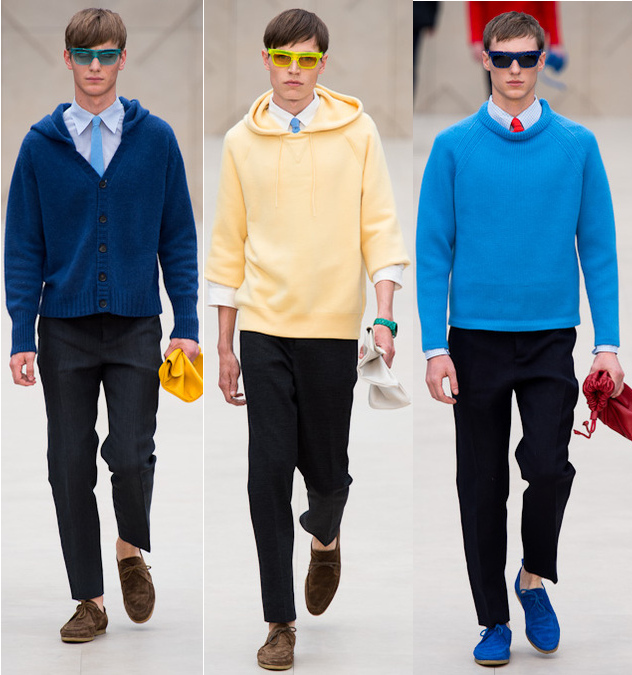 And finalizing his collection in several youthful colored cagoules - red, green, mustard, and blue - gave Bailey once again another creative triumph.